Synapse partnered with Seattle hardware startup cofounder Marc Barros, and hosted the Seattle Hardware Workshop for the third year in a row. This year Hardware Workshop is being held in 4 cities: Seattle, San Francisco, Boston, and New York. Started five years ago as a way to give back to the startup community, Hardware Workshop has helped hundreds of hardware companies develop real products. Started five years ago as a way to give back to the startup community, Hardware Workshop has helped hundreds of hardware companies develop real products. 2017 was the first year where Seattle’s Hardware Workshop had more female presenters than male presenters! 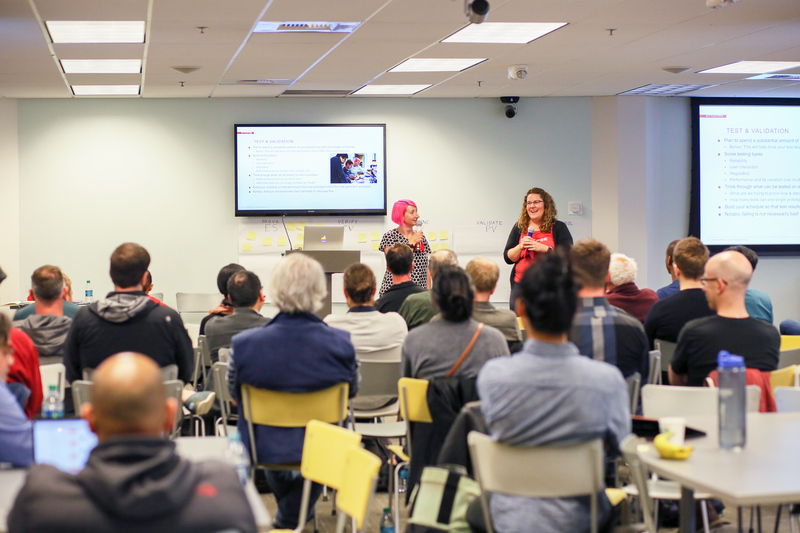 Synapse was proud to contribute to those diversity numbers: Martine Stillman (Mechanical Engineering Program Lead) and Kathy Fedirchuk (Product Quality Engineer) presented on Prototyping: How to do it (and how to do better). Synapse Account Directors led interested attendees on tours of the office, sharing products that we’ve worked on and providing a glimpse into the Synapse office culture. Day 1 Hardware Workshop attendees were very motivated to learn and network; the room was constantly buzzing with activity! Audrey Louchart (Moment) and Ian MacDuff (Product Creation Studio) started the workshop off with a bang, with an informative overview of the product development process and how to create successful products. Kate Whitcomb (Hax) and Johnna Hobgood (Sansaire) guided audiences through B2C distribution, and how important customer support, marketing, and trade shows are for new products. The session with the most questions was the short IP and patents presentation by Patrick Njeim and Candice Decaire (Kilpatrick Townsend) and Certifications (M Nelson Consulting). Bill Drislane from Dragon Innovation walked audiences through choosing a factory for all the right reasons! Then Pico Brew Beer was served and Bailey Nelson from Glowforge ended the day with an interactive presentation on building press relationships. Day 2 was a bit more relaxed, but the hardware entrepreneurs were ready to learn! Eric Klein (Lemnos Labs) kicked things off with a discussion on the importance of sales and hiring the right sales people. Bolt, a venture capital firm designed for hardware, sent two speakers from Boston, Chris Quintero and Ben Einstein. Chris dove into funding a hardware startup, while Ben kept it lighter, discussing the importance of a great team and the dos and don’ts of building your A-Team. Marc finished off the day chatting with the Hardware Workshop audience about their products and lessons that they’ve learned along the way. The day ended with (some more Pico Brew) a founder panel, where Kyle Hart (Rhino Camera Gear), Michele Mehl (Excy), and Brian Pape (Miir) discussed their founder woes and some of their favorite startup moments. Synapse has a long history of assisting startups to achieve their goals, often augmenting their hard science with our product development expertise. Hardware is hard. Synapse has a long history of assisting startups to achieve their goals, often augmenting their hard science with our product development expertise. Hardware Workshop is a great way for our engineers to connect with these startups all at once and hopefully share some tools so they can develop great products down the road! This workshop was also an important reminder that so many different things go into making a successful business: everything from customer support, to patent, to a business plan can make or break your business. Hearing from such a variety of speakers was an amazing opportunity for attendees to leave with a well-rounded view of hardware startups!